Bring out the outdoor furniture cushions and clean them up for spring and summer. Outdoor cushions are placed on chairs, benches and swings to provide a comfortable place to sit while outside. Martha Stewart manufactures a line of outdoor furniture, cushions and pillows to enhance your patio, deck or garden. 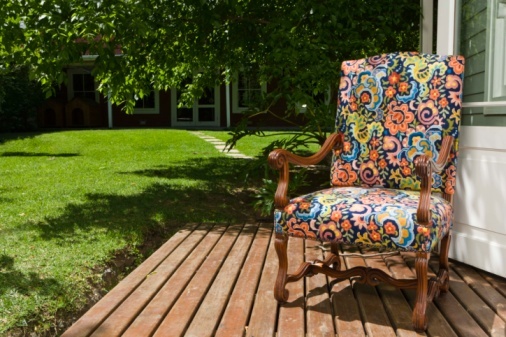 Her fabrics are made of acrylic and polyester-coated vinyl, which make cleaning them a breeze. While it is always recommended to remove the cushions during rain or snow, the occasional mold may creep up and attach itself to the cushion. Use a simple mixture to freshen them up quickly. Enjoy outdoor seating on mildew-free cushions. Apply water to the surface of the cushion. If the water beads up then there is still a moisture- and stain-resistance shield on the cushion. Mix together 1 tbsp. dish detergent and 1 quart warm water in a large bowl. Use the rag or soft-bristle brush to work the soap mixture around onto the cushion. Get into the creases and crevices of the cushion to remove any mold or mildew that may be hiding along the edges. Use a water hose to apply pressure to the cushion and remove any soap. Once the water runs clear from the cushion, stand it on an end and allow to dry completely. Spray a fabric protector on the cushion when it is completely dry. Apply a few drops of water to the surface to determine if they bead up and roll off, or saturate the fabric. If they saturate the fabric, mix together 1/2 cup non-chlorine bleach with 5 gallons of water. Mix well. Pour the mixture into a spray bottle and apply generously to the fabric surface. For large amounts of mold or mildew, allow the solution to sit on the fabric for up to 10 minutes before scrubbing. Scrub the area with a clean rag or soft-bristle brush. Work around the entire cushion to get into all cracks and crevices along the edge where mold or mildew will hide. Spray the fabric with a water hose to remove the solution once you have finished scrubbing. 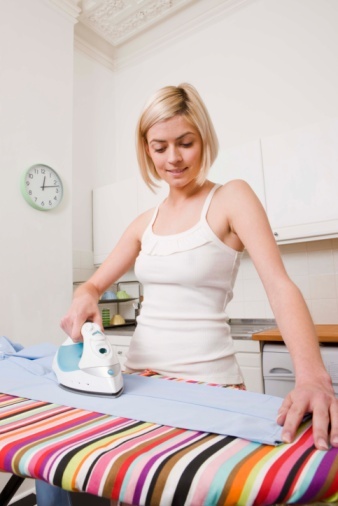 Stand the cushion on an end to dry the fabric before applying a fabric protector. Once the fabric is completely dry, apply the protector.